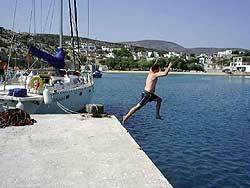 Iraklia, a small island just 3 miles S of Naxos It is the most westerly of the six islands that lie between Naxos and Amorgos. 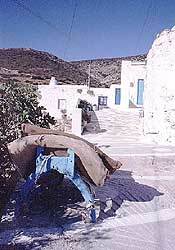 There are only two villages on the island which has a population of around 90 people. There are plenty tavernas at the port village of Agios Georgios, a group of houses spread over the hill behind the deep natural harbour where the boats dock. What you notice most about the houses are the patterns painted on the walls. For those who come to swim, there is a fine beach at Livadhi, below the site of the abandoned village of that name, just fifteen minutes walk from Agios Georgios. The Chora, also known as Panayia, is about 40 minutes walk from Agios Georgios. 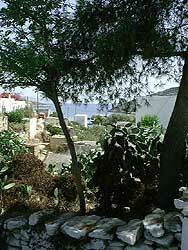 It is a pleasant one-street village with fine views of the surrounding islands. Pricky pears invade the village and there are a couple of small shops and a kafeneion. But sadly it is a village without a future. In 1998-9 there were eleven high school school students and nine teachers. In the school year 1999-2000 there will be four high school students and nine teachers. On the whole island there are only three small children. Well worth seeing is the cave of Agios Ioannis, which can be reached on foot. 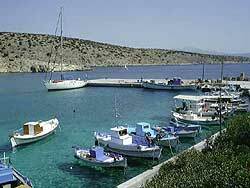 During the walk you will have fine views of the surrounding islands as far away as Naxos. The part of the cave which you can explore continues for 120 metres and there are stalagmites and stalactites to see.